Porcupines do not throw their quills, but when threatened, they contract the muscles near the skin which causes the quills to stand up and out from their bodies. When the quills are in this position, they become easier to detach from the body, especially when the porcupines swing their tails towards attackers. Porcupines are nocturnal and make their homes in rocky areas for daytime slumber. Some porcupines live in trees in regions where rocks are not abundant. The rodent is almost always found in a forested area, though the type of tree coverage may vary. A sure sign of a porcupine den is the pile of feces at the entrance of the cave or tree hollow. Porcupines do not hibernate, though they will remain inactive for long periods of poor weather. Cold weather will often drive this solitary creature to shared den sites with others of its kind. What Porcupines like to eat? 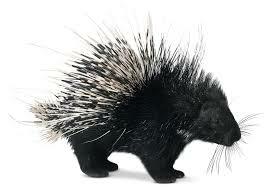 Porcupines like to eat plants which can be really annoying if you have a vegetable garden or try to keep flowers. Porcupines will devour all the vegetation in your yard and can even kill trees by stripping the bark off of the bottom of the trunk and eating the roots. Porcupines are also addicted to salty things, so if you have tools, gloves, clothes or anything you could have gotten sweat on, porcupines will chew up. These critters have super strong jaws and can mangle your tools, believe it or not. If you have porcupine problems, try some of these suggestions to get rid of them.